Wicker Park Group periodically revisits some of our most popular blog posts. This post, our most read in 2017, was originally posted in November. Those readers familiar with Wicker Park Group are aware of our key theme in 2017: Adding Value. For those of you new to the concept, adding value is one of the most important qualities necessary to building long-term, trusting, meaningful client relationships. 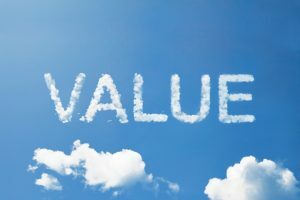 Clients routinely mention adding value as one of the key differentiators of their most important relationships, and yet lawyers almost always need more clarity on what it actually means to add value. It is a topic during almost every client interview, a theme at more than 10 law firm retreats we’ve attended this year and something we train on during every business development training program. Clients have very specific ideas when discussing adding value. However, most of the lawyers we meet, train or present to at retreats still really struggle with specifics around the topic. I was reminded of the discrepancy recently while presenting at a firm retreat. We broke the groups into tables and asked them to write down three ways they individually add value to their client relationships beyond the legal bill and then share at their respective tables. The tables then reported their best three ideas to the larger audience. As I walked around the room, it was apparent the lawyers were really struggling to come up with different or specific ways to add value beyond the practice of law. When asked during client interviews, clients never seem to have that problem and instead have very concrete examples of what lawyers are doing and/or could do to add value. Ask about a client’s internal demands, pressures and deadlines and submit deliverables in advance to allow proper time to review, edit and finalize. Know the business nomenclature as well as or better than your client and ensure that everyone working with the client has the same level of knowledge. Appreciate if the client is a morning or an evening person and submit work or schedule calls around the client’s preferences. Help your client look good internally. Develop and present a CLE or educational topic that is relevant, focused, tailored and timely for the client’s business and industry—and have the speakers be entertaining and energizing. Understand how the company makes money and intends to grow and introduce contacts to potential clients that align with their ideal profiles. Your law firm has thousands of clients; you have potential clients for them. Attend a conference on the client’s behalf and bring the information back to the entire team. Second someone at the firm (not at an hourly rate) for maternity/paternity leave and other extended leaves of absence. Understand what metrics and activities drive the client’s personal bonus and help the client achieve those goals. Create a communication chain of command and list of key individuals in an effort to never be the bottleneck for information and responsiveness. Respect all individuals at the company equally, which includes assistants, paralegals, junior lawyers and business team members. Help the client plan vacations, find nannies, solve personal problems and make business travel easier when least expected. Forward an article with highlighted sections of what the client should read, how it relates to the business, why the client should care and what to specifically do with the information. Highlight all the services, advice and travel you do not bill for and summarize these items at the end of the quarter or year. Specifically ask how you can add value beyond the legal bill and deliver on those requests.